It might be hard to imagine, but it wasn’t so long ago there was little alternative to Pizza Hut if you wanted pizza by the slice. Well, things have changed since then, with myriad places offering this Italian take on snack food – “A slice is a snack, while a pie is an entire meal,” a friend once told me. 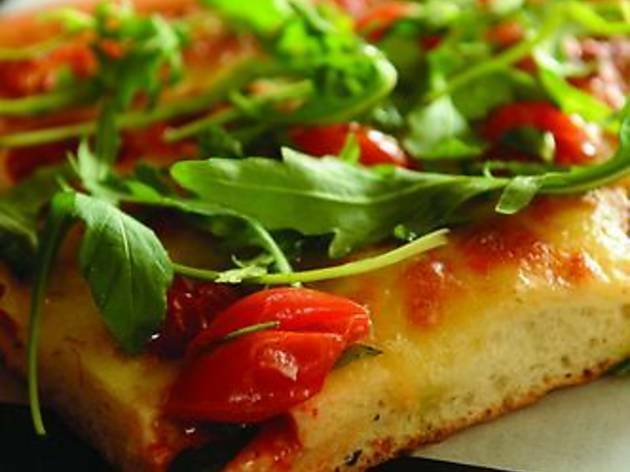 Now Star Street has its own outlet, in the form of Pizzetteria, a small pizza café opened by an Italian native of Napoli. The square slices of pizza are sold by the 100 grams in this tiny shop once occupied by Shake ‘em Buns – with few counter seats, it’s better to grab and go. The focaccia-style base is thick and doughy, and the ingredients simple and traditional – exactly what you might expect to find in Florence, Sicily or Napoli for that matter. Try their thinly sliced zucchini over a ‘white pizza’ (no sauce), Margareta pizza, or a classic combination of fresh mozzarella, baby tomatoes, topped with fresh arugula, which is the one we chose ($35). The thick bread base was crispy at its crust, but rather dense and dry. 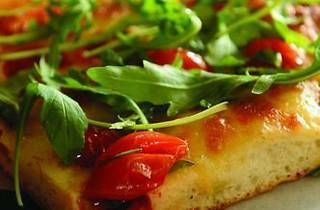 A nice focaccia should be slightly moist, buttery, and filled with air pockets. This dough, however, had little to brag about. The topping was very authentic though; not overly sauced, just a scattering of cheese, and a salad that offered a peppery aftertaste. Their arancini, (Neapolitan rice ball, $28) is a staple in Italy, but a rarity in Hong Kong. An elongated ball of creamy short grain rice was embedded with oozing mozzarella cheese, and then breaded for the deep fryer – true comfort food goodness. There are also other carb-goodies such as baked pasta, and zeppole fritte (fried dough). However, if you’re feeling guilty from over indulgence, they serve a green salad (ingredients and prices vary from day to day). You’d be missing out if you ordered it, though. 2A Star St, Wan Chai, 2861 3066. Daily 11am-9pm. Meal for two: around $90.